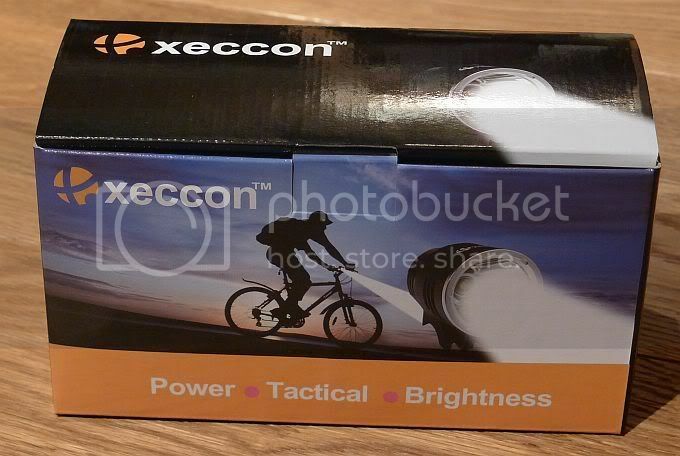 ...Xeccon are not the most well know flashlight brand, but you may well already own a flashlight made by Xeccon’s parent company without realising it. 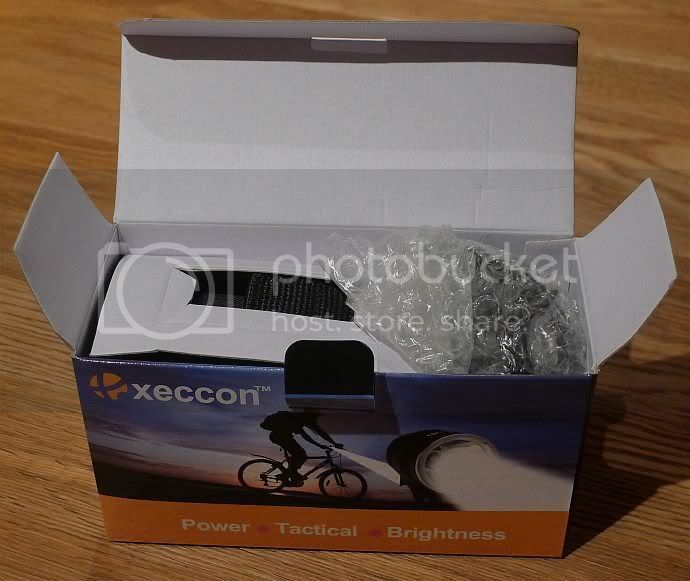 Xeccon are part of Strivers Holding Co., Limited who have been an OEM flashlight manufacturer since 2007. 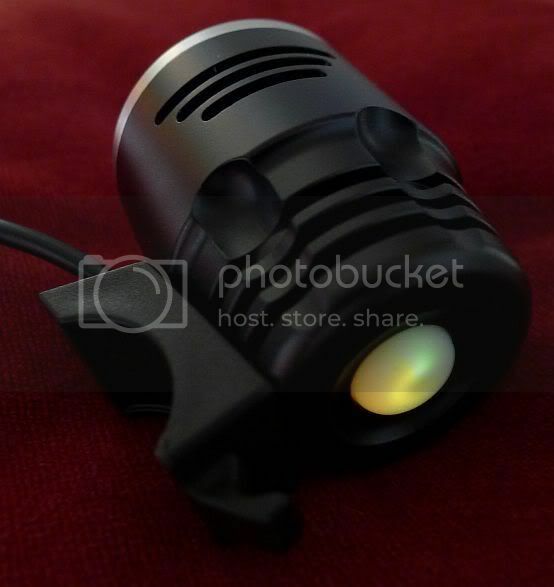 They produce HID flashlights, as well as diving, xenon, LED, bicycle and solar lights. Their QC team ensures that the finished products are fit to bear CE, UL and Rohs marks. 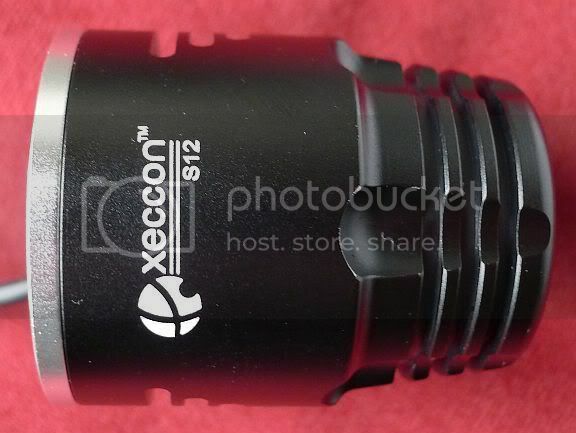 Having successfully manufactured OEM flashlights (which are then rebranded) for several years, the Xeccon brand was established to promote great value direct sales of the flashlights. The review will consist of my initial impressions, some measured output/performance figures and then look at how it has performed for me in real life use. 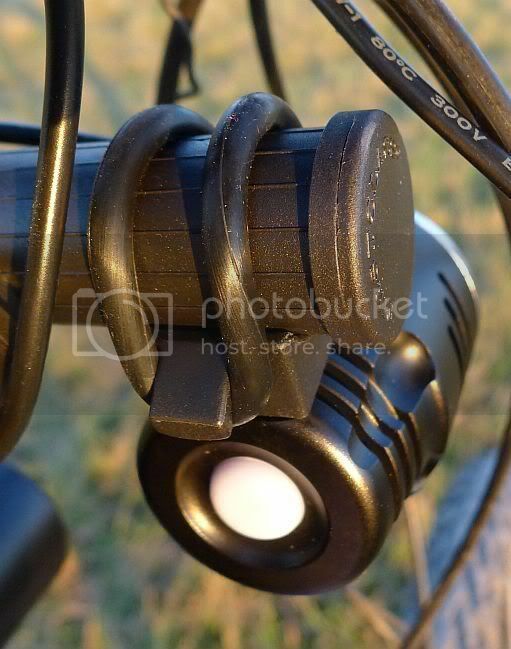 The S12 is Xeccon's most powerful and latest bicycle light. 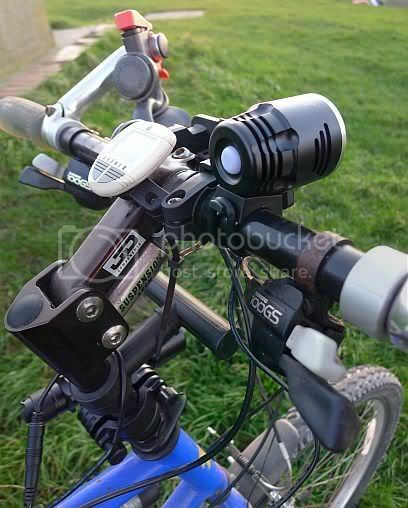 As a dedicated bike light, the S12 is a step up in performance and runtime, compared to torches mounted on a bike. 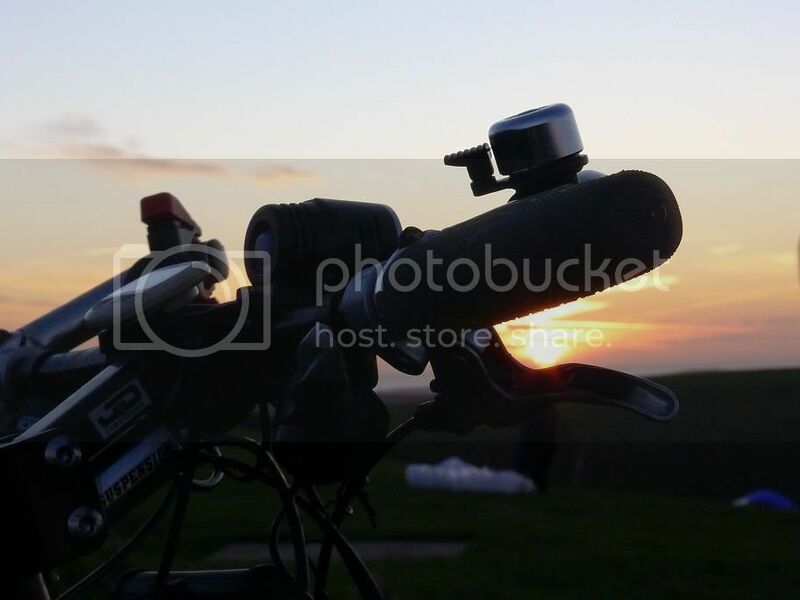 The S12 sells for $50.99, including delivery, on Xeccon’s outlet website called FlashlightBox, so is built to compete in price with the many other bicycle lights on the market. At this price you will not get high end features, instead you get a good build quality and a lot of performance for the money. 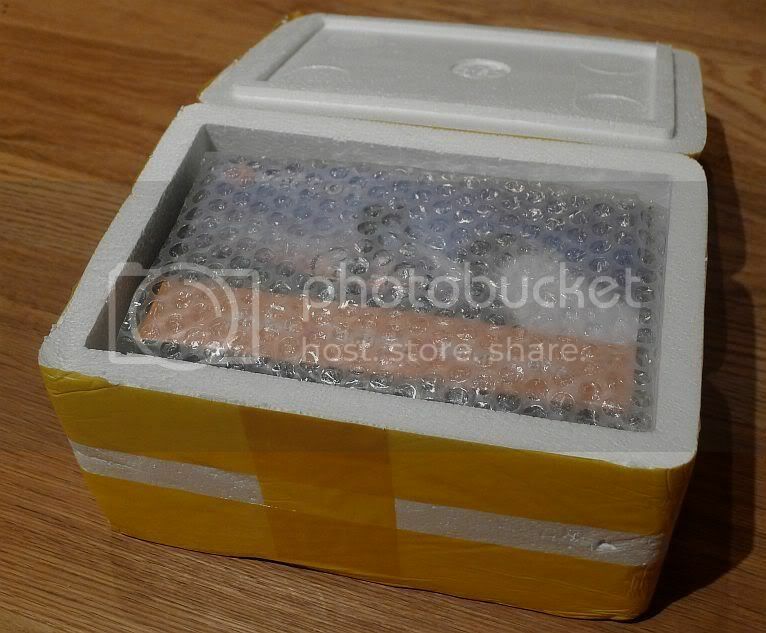 The S12 was packaged very well in a polystyrene box. Inside the retail packaging was in pristine condition and nicely presented. The S12 consists of the lamp assembly with integral handlebar mount, the battery pack inside a cordura pouch for mounting onto the bike, two large o-rings used to mount the lamp and a headlamp convertor to allow you to wear the S12 as a headlamp. Also included are a mains power charger and plug adaptor for your country. The lamp assembly has lots of machining detail and has vents that expose some internal heatsink fins. When the battery pack is connected, the switch is illuminated. The LED is well centred and in this photo you can see how the reflector appears evenly yellow as it reflects the colour of the XML T6 LED. Overall quality is good and it feels like it will survive pretty hard use, though I do wonder how tough the plastic fixing points are for the o-rings. 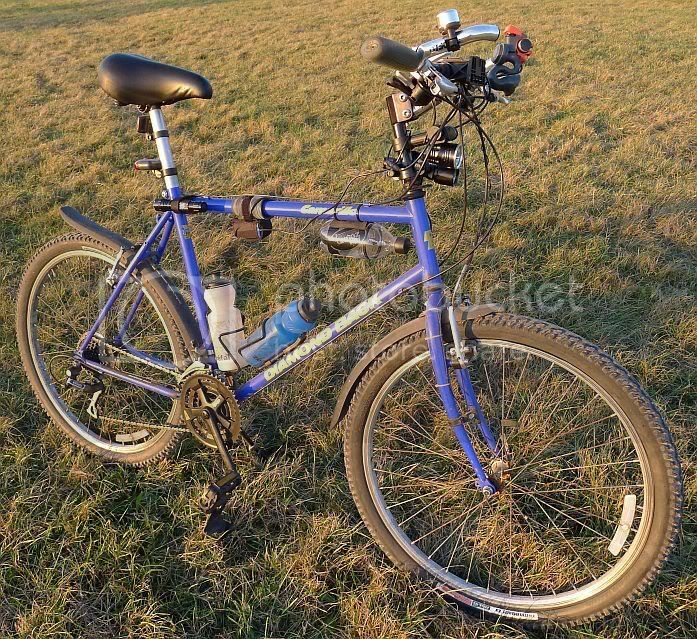 My testing bicycle is a fully rigid old-school Diamond Back Camarillo. 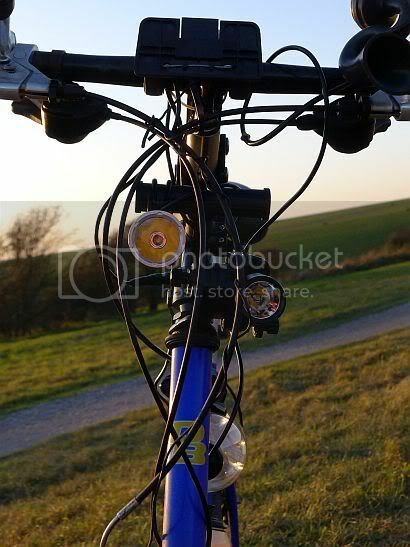 To save my hands on rough trails I use an unusual ‘suspension stem’ which allows the handlebars to move up and down. 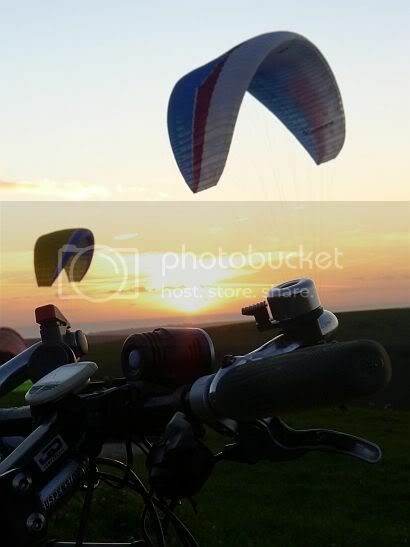 As the handlebars move, it is not possible to mount a light directly on the handlebars as is will be bouncing around all the time. Instead I have a T-mount fixed to the extended stem, giving a solid mounting point that turns with the handlebars. Detail of the mount using the large o-ring to secure the lamp. I have mounted the lamp under the bar as this suited my requirements. The strap for the battery pack was unfortunately not very flexible and would not mount securely when I attempted to attach it directly to the frame tube as the strap’s minimum length was too long. 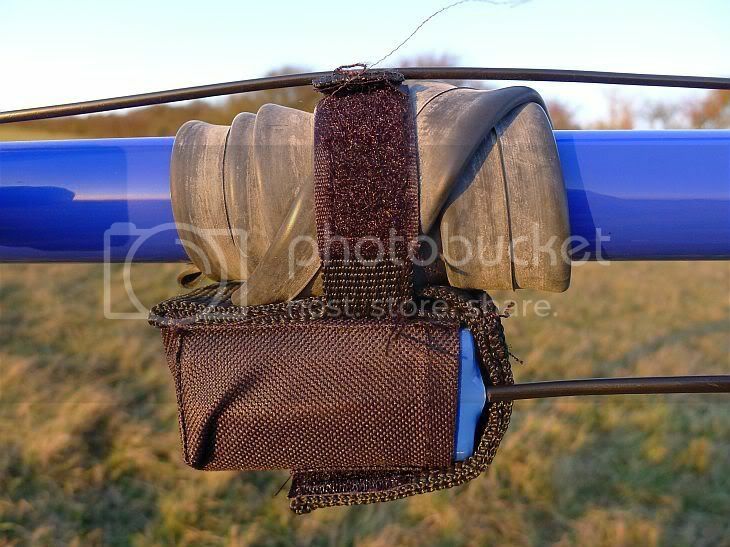 As a quick fix I wrapped a length of old inner tube around the frame to make the mounting point thicker. This actually worked very well. One point to note is that the battery connector needs to be firmly pushed together. Initially I didn’t pushed the connector together completely and thought it was faulty as the connection was not secure. You need to ensure that the plastic sleeve on the socket overlaps the plug by about 5mm; this makes the connection secure and watertight. 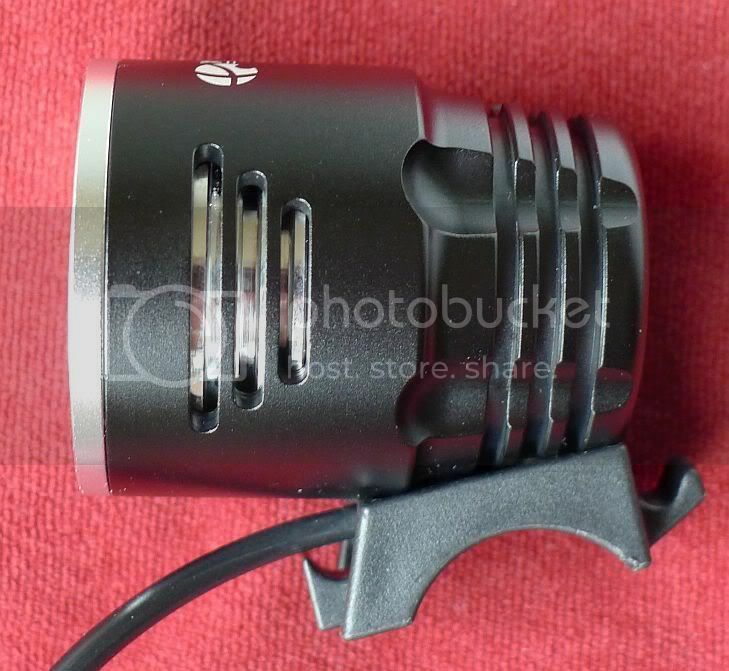 The S12 has three modes, High, Low and Strobe. When you connect the battery pack the lamp flashes briefly and the button glows softly. The first press of the button enters High, the second press gives Low, the third Strobe and the fourth turns it off. 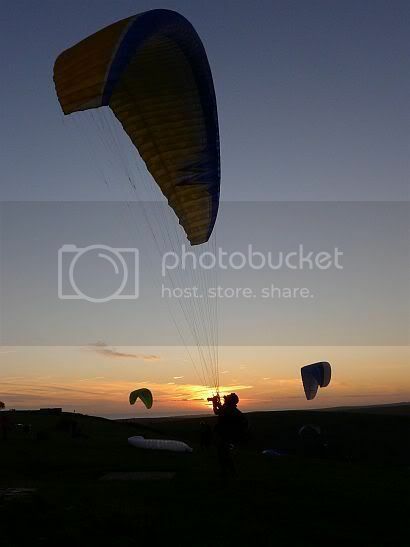 High is a current controlled constant output. Low is provided by PWM but seems to be a high enough frequency not to be noticeable in normal use. When you disconnect the battery completely, the lamp remembers what mode it was in so when you reconnect the battery it comes straight on the last used mode. My preference has been to switch off the S12 by disconnecting the battery rather than go through all the modes. As in a previous review, I decided to try and quantify the actual beam profile. There are probably many flaws in my method, but it is simple and easy to carry out and seems to provide a good enough comparison. The method used was to put the light on the edge of a table 1m from a wall, with a tape measure on the wall. The zero of the scale is placed in the centre of the hotspot and a lux meter is then positioned at points along the scale, with the measurements recorded. Beam shots are often taken with the light shining on a flat white wall, so this method is simply measuring the actual intensity across the beam on a flat surface, not the spherical light emission. 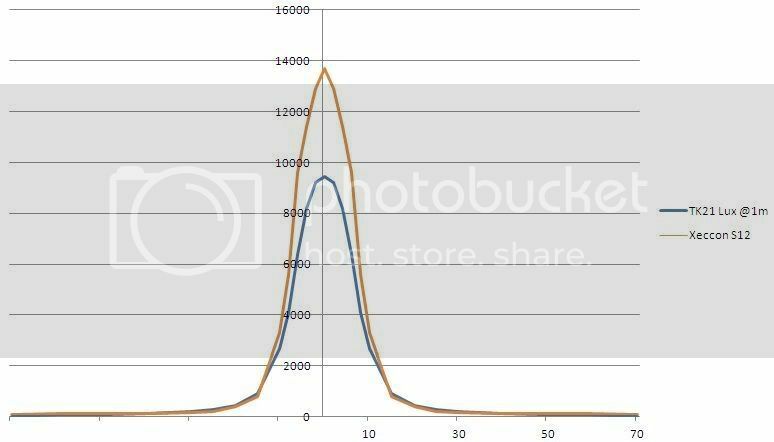 The results are then plotted on a graph. For the best throw you want to see a sharp peak with less of the distracting spill. For the best flood light the trace should be pretty flat. A Fenix TK21 is used as a reference XML light. The profile shows a significantly greater throw is provided by the S12 compared to the TK21. Taking this a little further, I calculated an approximate factor to apply to the lux measurements, as each measurement gets further from the centre of the beam, it corresponds to a larger area onto which the light is falling. It seems to me that this should also be taken into consideration, so I applied these area corrections and came up with this odd looking graph. The key quantity here is the area under the graph line. This should correspond to the total light output. Specified as 5 hours on high, my initial test found this to be around 3 hours. During this time the output was consistent and in my intermittent test to attempt to simulate real life use I ran it for 2 hours, then 24 hours later a further hour (which ran constantly at the full output), and when I came to turn it on again a day later it was completely dead. The specification for the battery is 8.4V 6400mAh. Based on the tests I have carried out it appears to be a lower capacity than this. The battery pack consists of 4x 18650 cells wired 2P 2S. Be aware though that while the battery is connected there is a small current draw to light the switch and power the circuitry. I have measured this as 0.019 A or 19 mA. When running on High the S12 is very bright, though I don’t think it achieves the specified 1600lm which is confirmed by the results found in the beam profile graph. When delivered the battery measured 7.67V, so was put on charge. This first charge took a couple of hours and the charger became quite warm at 48C. Once the charger's green light was showing, the battery measured 8.38V. The charger itself measures 8.42V open circuit. Running the light indoors, it quickly heats up and reached a maximum of 67C. During the runtime test, the battery was run down to the point that the S12 would not turn on and measured 0V. Although not visible, nor mentioned in the S12’s specifications, this suggests to me that there is some protection built into the pack. After putting it on charge, it took a full charge and worked normally. Shown here is a direct comparison of the S12’s beam to the Fenix TK21 used as a good reference XML light. The beam appears very well formed even when viewed on a white wall. In this photo the beam is directed across a valley showing how powerful the beam is. 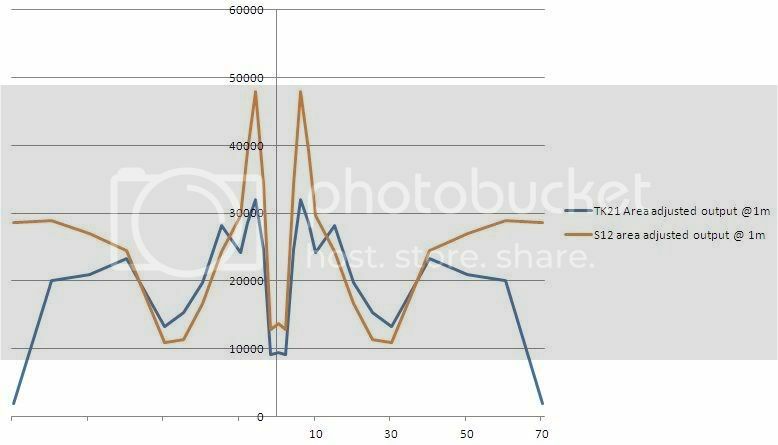 High and low outputs are shown for comparison. Looking at it and a few graphs doesn't tell you much about what this is like to use and how it performs in different situations. 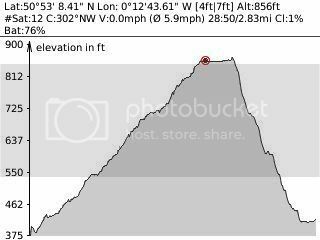 My standard test route involves a ride up to a local scenic viewpoint, with a short section of street-lit road followed by unlit tarmac pathways and tracks, and a climb of 479ft/146m over the three miles there. The return downhill journey allows for speeds up to 30mph over rough ground providing a severe test of shock resistance as the bike is fully rigid so has no suspension to soak up the shock. The S12’s simple mount stood up well to the severe shock due to riding at speed over very rough tracks. The light did not appear to lose its alignment, certainly not enough to notice on the ride. I used the smaller o-ring, so it is fitted tightly, which may be why it has held so well. 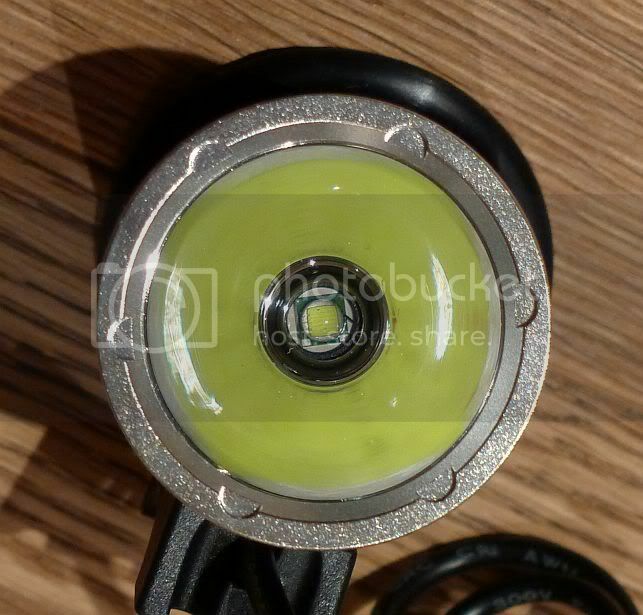 Regardless of whether the output really is 1600lm or not, this light provides excellent brightness and gives you great confidence to ride quickly even in totally unlit rough trails. 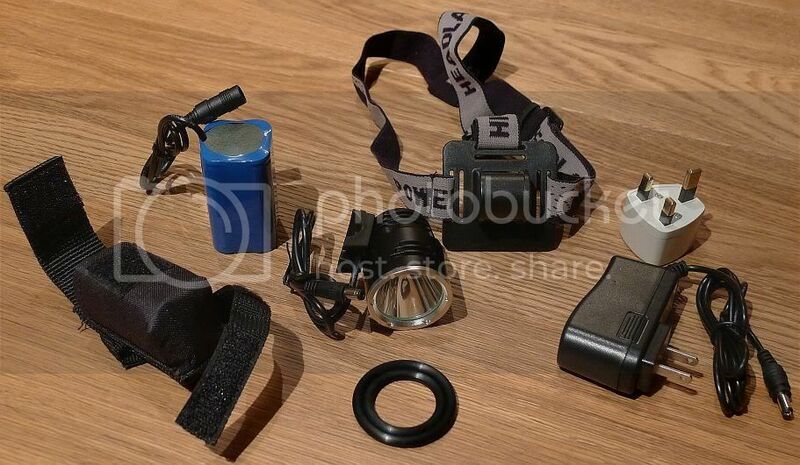 The inclusion of a headmount strap which allows you to use the S12 as a headlamp is a nice addition. Unfortunately, the mount has no cable routing clips or indication of whether the battery should be belt mounted or on the headband. The range of angle adjustment is not really enough to aim the light properly into the distance, which considering the power of the S12’s beam is what you really need. The high output is much too much to use close up. 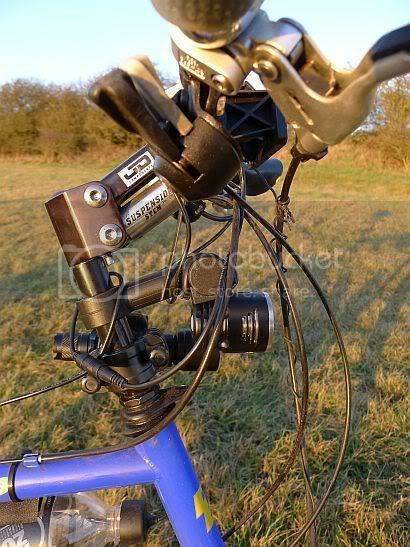 If you have a small file you could slightly modify the headlamp mount to allow more angle adjustment. A ‘nice to have’ addition but not its primary function. The S12 is certified to IP-X6 and should stand up to any normal cycling conditions. Yesterday I gave this an unplanned and thorough testing when what started as simply another ride to use the S12, turned into a battle with the weather. As I started the ride, small droplets of water typical of mist or fog were visible in the S12’s, and as I started the ascent, these increased in quantity. Thinking it would just be a misty ride I pressed on, but the mist started to turn into light rain. Thanks to a following wind, the ride was strangely quiet. The rain got gradually heavier. Visibility was getting worse and by the time I reached the viewpoint the powerful beam of the S12 was only able to give me 2m visibility and I had to follow the edge of the road all the way to the top. With the rain getting heavier still and the wind picking up I started the return journey. The sharp descent allowed me to quickly drop down below the thick fog, but the wind and rain became ferocious knocking me about. With the rain stinging my face and my eyes blinking furiously the S12 was being drenched with rain and wind blasting into it. The S12 was unaffected and the unfaltering beam guided me home. At times, the gusting headwind hit me so hard it stopped me in my tracks, only to relent and allowing me to make progress. In the worst weather I’ve ever ridden through, that made it almost impossible to ride, the S12 delivered an unfaltering performance. With no intention to repeat that experience I feel confident that the S12 will reliably light the way for me.